The story of 'Netherlands Ma' and her half-brother 'Netherlands Tilu', is, at the very least, intriguing and beguiling. Both cats represent the 'second' type of 'Siamese', acknowledged by both the Siamese fanciers of the era, as well as officially by The Siamese Cat Club, 'as a variety of Siamese', referred to at that time, as 'Chocolates'. Some breeders referred to them as 'Temple Cats', but no matter what they were called, the intention was clear, to segregate them from the 'first' variety, which were expressly known as the 'Royal' Siamese (or 'Palace' cat), which were denoted specifically by their very light fawn coat colour , with deeply contrasting points, and their most notable blue eyes. ...all cats coming out of Thailand were 'Siamese' cats, regardless of colour. Both 'Netherlands Ma' and 'Netherlands Tilu' were registered as the 'Chocolate' variety, and it is important to make that distinction, for the name did not so much refer to the colour as it did to draw attention to the fact that these were a different 'variety' of Siamese, remembering simultaneously, that the 'breeds' of cat were defined firstly by their 'country of origin'. Hence, it was universally accepted, that all cats coming out of Thailand were 'Siamese' cats, regardless of colour. It is likely that both Netherlands Ma (originally called 'Ma') and Netherlands Tilu (originally called 'Tibi' or 'Tilu') were bred in the South of France and imported into England within months of their birth. Over a period of approximately three years, they would change hands multiple times, would be bred and shown in England, then be exported to the United States, where they would again be exhibited and bred and then again change hands for the last time. So it is fitting that we view them together and also take a look at their siblings and half-siblings, some of which were of the same 'variety' and some of which were registered as 'Royal Siamese', being fully pointed. We have one image only of 'Ma' and although a poor one, it is none the less, rather startling, in that what we see, is a very dark cat, of an almost universally even and dark body colour, but still showing a definitive pointing, albeit, of poor contrast when seen next to the body colour. So before we draw any conclusions as to her colour and what it may mean, let's first take a look at what the writers of the era had to say about the 'Chocolate' variety. From this comment we may deduce that at least one of the kittens was darkening at a faster rate, with the breeder's expectation that it would turn into a 'Chocolate variety'. So it would not be unreasonable to assume that the fully pointed kittens would all resemble the 'Royal Siamese' and retain the blue eyes, - but what of the last kitten? Would its eyes be rich amber like the mother? Or perhaps they would be aquamarine?, and the kitten, although somewhat darker than its littermates, may not necessarily have been as dark as the mother, possibly emulating what we would today refer to as a Seal Mink? Definitely food for thought! With the conclusion of the missive, it is duly signed by A. Forestier Walker, Jean A. Spencer, May Robinson, L. Parker-Brough, S.E. Backhouse, and Constance Carew Cox. Despite this apparent desire to breed each variety to their own kind, the registry bears witness to the fact that many breeders did still cross Chocolates with Royals as much to obtain Royals as anything else. If, as the Committee had originally desired, the Chocolates had been bred together to create a permanent and distinctive variety, then the history of this particular colour range, would have probably taken a very different path. It is also likely that the genetics behind it, may have been revealed and understood a great deal earlier. But such was not to be the case, and due to the preferences shown for the fully pointed and contrasted coat pattern of the 'Royal', over a relatively short period, the desire to keep and maintain an independent line of 'chocolates' appears to have diminished and then ceased altogether, through what was probably an admixture of a lack of encouragement, coupled with genuine breeder apathy. "There are two distinct varieties in the present day. (1) The royal cat of Siam, cream-coloured in body, with sharply-defined seal-brown markings on head, ears, legs, feet and tail; eyes a decided blue. The cats generally become darker after two years old, but where great care has been taken in breeding the true royal cats keep the light colour longer. The larger, lighter coloured cats have china or ultramarine blue eyes, the more slender, darker cats have deeper-coloured eyes. (2) The chocolate cats are deep brown in colour, showing hardly any markings and have blue eyes." 1 (No mention is made of the shade of blue!!). "The points of the chocolate Siamese are the same as the royal, with the exception of body colour, which is a dark rich brown all over, thus making the markings less noticeable. All Siamese cats darken with age, and when they get dark, there is a tendency to call them chocolates. I know of only one real chocolate - Mr. C. Cooke's 'Zetland Wanzies' - so consider them more likely to be a freak than a distinct variety. "1 (Ed: already we can detect a clear and serious lack of interest in preserving the 'chocolate' variety, in direct contradiction to the stated objectives of the Siamese Cat Club). So in assessing these commentaries from several of the most noteworthy breeders of Siamese, we begin to get a consensus on the Chocolate variety: - They are dark coated, - brown or seal bodied, - with even darker points. They either have rich amber eyes or blue eyes, with the yellow-amber eyed cats considered to be the originating colour, - and the blue-eyed (possibly aquamarine- eyed) cats to be the result of the cross-breeding of the 'chocolates' to the 'royals'. 'Ma' was born 1st August 1897, bred by Mrs. Sutherland, who was the owner of both her sire and dam, the sire being 'Prince of Siam', and the dam being 'Musidora'. In this article we will be looking at all the known progeny of 'Prince of Siam' and 'Musidora', as well as those of 'Prince of Siam' and a female known as 'Kinck', who were the parents of 'Netherlands Tilu',(aka 'Windsor He'), a sire sibling of 'Ma' that was sold with her, and moved with her from home to home. ... he is unequivocably included in the list of cats bred down from the original 'Tiam O'Shian'. Although there are no entries in either register for 'Prince of Siam', in the CCR (Studbook and Register of 'The Cat Club), nearly all the entries of Mrs. Sutherlands cats bred from 'Prince of Siam', give his parentage as being by 'Puppy' ex 'Susa'. His existence as the sire of at least two progeny out of 'Kinck' both born in October 1897, is also corroborated in the NCC Studbook. There is no reason at all to doubt this heritage, which harks back to the original 'Tiam O'Shian' out of Bangkok. This is reinforced by a statement in by Mrs. Carew-Cox in The Book of the Cat, where he is unequivocably included in the list of cats bred down from the original 'Tiam O'Shian'. If we look then, for a probable date of birth, we do not have to go far to find a possibility. A full sibling from 'Puppy' and 'Susa' exists in 'Princess of Siam' owned by Mrs. McLaren Morrison, born in May 1895. This female was bred by Mrs. Chapman, who is also listed as the owner of the sire 'Puppy' by 'Tiam O'Shian'.2 It therefore seems both probable and extremely likely that the two were from the same litter, the male being named 'Prince of Siam' and the female 'Princess of Siam'! It should also be noted, that none of these cats are listed as Chocolates, so we are left to presume that they were all 'seal-pointed' or 'Royals'. As a male with a doubling in his pedigree on 'Tiam O'Shian I' plus a direct line of inheritance via his dam back to 'Susan', (another of the original imports from Bangkok), this made him a highly desirable commodity. We also know that in her matings to 'Royals' or 'seal-points', she consistently produced the 'Chocolate cat of Siam' in her litters, which leads us to believe that she was herself, a 'Chocolate'. It is unlikely we will ever know whether she was a Blue or Aqua-eyed Chocolate, as opposed to an 'Amber-eyed' Chocolate. Similarly, 'Kinck' is also not individually registered in either the Register of the National Cat Club (NCC) or that of The Cat Club. (CCR), but like Musidora, does appear as the dam of a variety of progeny. She too is included in the listing of The Siamese register compiled by Major E. Woodiwiss in 1924, appearing as 'Kinck', with "particulars unknown", owned by Miss Sutherland.2 In this case we have no other information, but it is equally likely that she also, like 'Musidora', may have been an imported cat from Bangkok. Similarly, she too, consistently produced 'Chocolate' kittens when mated to the 'Royals' or 'Seal-pointed' 'Prince of Siam'. This leads us to believe that she too was herself of the 'Chocolate' variety. 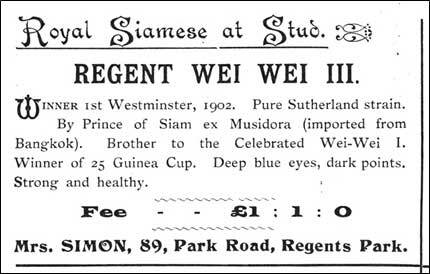 For a complete listing of full and sire-siblings, we will take at first, a glimpse at those cats that are from both 'Prince of Siam' and 'Musidora', followed by those from 'Prince of Siam' and 'Kinck' and even a few of their progeny, where it illuminates an interesting familial fact. From 'Musidora',(sire and dam unknown), owned by Miss Sutherland, a litter born 10th March, 1897. 'CHIARMI', a Royal Siamese male. 'SOOD', a Chocolate Siamese female, retained by Miss Sutherland. From 'Musidora', (sire and dam unknown), owned by Miss Sutherland, a litter born 1st August, 1897. 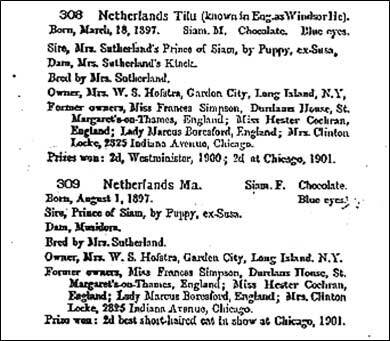 'MA', a Chocolate Siamese female, first sold to Miss Heather Cochran, later becoming the property of Lady Marcus Beresford, then passed to Miss Frances Simpson, who exported her to Mrs. Clinton Locke, who exhibited her in Chicago before passing her on to Mrs. W.S. Hofstra, in New York, with whom she was registered as 'Netherlands Ma'. (BCC: 309). From 'Musidora', (sire and dam unknown), owned by Miss Sutherland, a litter born December, 1898. In this, we find 'Musidora' clearly listed as an import from Bangkok. From 'Musidora', (sire and dam unknown), owned by Miss Sutherland, a litter born 28th April, 1899. 'MINTHAMEE', a Royal Siamese female, firstly owned by Miss Heather Cochran, then later becoming the property of Mrs. W. M. Nield. From 'Kinck', (sire and dam unknown), owned by Miss Sutherland, a litter born 18th March, 1897. 'TILU', a Chocolate Siamese male, originally sold to Miss Heather Cochran, then transferred to Lady Marcus Beresford, when he was re-registered as 'Windsor He'. Later he was passed to Miss Frances Simpson, who exported him to Mrs. Clinton Locke, who exhibited him at Chicago, before passing him to Mrs. W.S. Hofstra of New York, under his new registered name of 'Netherlands Tilu'. (BCC: 308). 'TIEN', presumed to be a Royal Siamese male, recorded in the Siamese Cat Register with the same date of birth and parentage as 'Tilu'. Listed as owned by Miss H.Cochran and shown at Westminster in 1900 for a second. Interestingly both brothers gained a 2nd at this show in their respective breed varieties! From 'Kinck', (sire and dam unknown), owned by Miss Sutherland, a litter born 1st August, 1897. 'MISSIS', a Chocolate Siamese female, who became the property of Miss J.Derby Hyde. Not to be confused with 'Thames Valley Missis' descended from King Kesho! From 'Kinck', (sire and dam unknown), owned by Miss Sutherland, a litter born, October, 1897. 'JUN', a Royal Siamese female, owned by Mrs. Parker-Brough. In January 1901, 'Jun' was to produce two Royal Siamese females named 'Cairo Cleopatra' and 'Cairo Duro', in a mating to Mrs. Robinson's 'Ch. Wankee'. In April 1901, in a repeat mating to 'Ch. Wankee', she produced another Royal Siamese female, named 'Cairo Sphinx', all for Mrs. Parker-Brough. 'MOON CHOW', a Royal Siamese male, (aka 'Windsor Moon Chow')owned by Lady Marcus Beresford. It would be a reasonable assumption to suspect that 'Tilu', the Chocolate Siamese male (born March 1897) and by now already owned by Lady Marcus Beresford, was replaced in favour by his 'Royal' Siamese, full younger brother, 'Moon Chow'. 'WEI WEI', a Royal Siamese male, owned by Mr. George Towlerton. 'SUSA II', a Royal Siamese female, sold to Miss Hester Cochran. The lives of 'Ma' and 'Tilu' were inextricably linked. Both were sold together each time that they changed hands, probably so that they could be bred together to produce an independent line of the 'Chocolate Cat of Siam', while knowing that both could also independently produce 'Royal' or Seal-pointed offspring when outcrossed to 'the Royal cat of Siam'. The entry for 'Netherlands Tilu' and 'Netherlands Ma' in Volume II of the Register of The Beresford Cat Club. (note the following references to a) 'Windsor He'; b) to Prince of Siam by Puppy, ex Susa; c) to the former owners; d) to the wins at Chicago. Both cats were bred by Mrs. Sutherland and originally sold to Miss Heather Cochran, who later passed them both to Lady Marcus Beresford. Their path of ownership is recorded in Volume II of the Register of the Beresford Cat Club, where they are listed as entries 308 and 309 for 'Tilu' and 'Ma' respectively. The change of ownership of 'Tilu' (as 'Windsor He') and 'Ma' from Miss Cochran to Lady Marcus is also recorded in the CCR, (Stud Book and Register of The Cat Club).While in the ownership of Lady Marcus Beresford, 'Tilu', now re-registered as 'Windsor He', was advertised at Stud as a 'Chocolate Siamese', (a copy of that advertisement is shown further below). 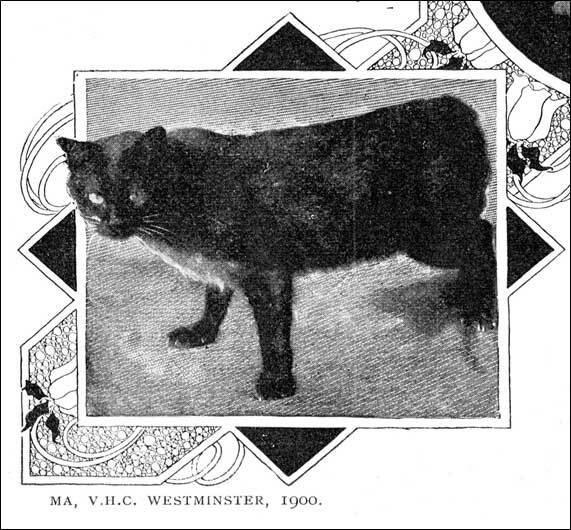 Both cats were shown at Westminster in 1900, but it is unclear as to whether they were then under the ownership of Lady Marcus or had already been accepted into the care of Miss Frances Simpson, into whose hands they were duly passed. But 'Ma' is recorded as having gained a VHC at Westminster, and 'Tilu' a second. They were then duly exported by Frances Simpson to Mrs. Clinton Locke in Chicago, where they were once again shown in 1901, 'Ma' winning a Second Best Shorthair Cat in Show!, while 'Tilu' had to suffice with a second once more. 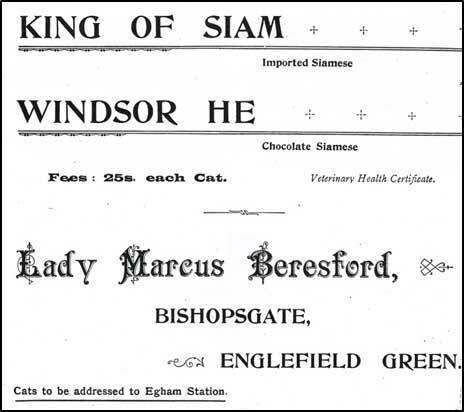 'Ma' was clearly considered to be the cat closest to the Standard for a 'Chocolate Cat of Siam'. But that was not to be their last journey. At some point after the Chicago Show of 1901, they were again sold as a pair, to Mrs. W.S. Hofstra of Garden City, Long Island, New York, which appears to have been their final settlement. Mrs. Hofstra, is shown as the Vice-President of The American Cat Association, in the first Volume of that society's Stud-book.? With this change of ownership came their name change to 'Netherlands Ma' and 'Netherlands Tilu'. There are no records extant of progeny from either 'Netherlands Ma' or 'Netherlands Tilu', but that does not preclude them from having bred successfully. In fact, that seems unlikely that they did not breed successfully, or they are unlikely to have changed hands as often as they did! 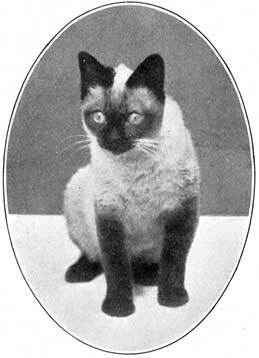 But when Lady Marcus Beresford replaced 'Tilu', with his younger 'Royal' brother 'Windsor Moon Chow', she did eventually register progeny from 'Moon Chow' and one of these, a sealpoint Siamese female named 'Windsor It' appears in Frances Simpson's The Book of The Cat (1903) and is pictured here. At this juncture, we should now take a moment to put the whole into some sort of historical context. Nothing in history is totally isolated except by design, and we do know that the royal patterned Siamese existed (was recorded), from as early as the 13th century during the Ayudhya Dynastic Period. This pattern, known as the 'Wichien Maat', is clearly recorded in the 'Tamra Maew' (Book of Poems), in which some seventeen varieties of Thai cat are depicted. That resembling the Siamese is described as the 'Wichen Mat' or 'Wichien Maat' and is a fully pointed cat. Also appearing in the 'Tamra Maew' is a Blue cat, known as the 'Dork Lao' or Lao Flower and is associated with the green-eyed Blue Thai cat we today know as the 'Korat'. Another colour described in this same document is the Thong Daeng or Copper-Coloured cat, which today we would normally associate with either Burmese or Tonkinese colouration. So all of these colours plus another fourteen adaptations were all probably extant in Thailand at some point between the 1350's and 1700 AD and some will have survived into the 19th century when the first recorded importations of cats similar to these were imported into Europe. The great city of Ayutthaya, (Ayudhya) which lay some 40 miles north of Bangkok, was at one time one of the largest cities in the Eastern World and was sometimes referred to as 'The Venice of the East'. The city was founded in 1350 by King U-Thong. It remained the capital of Siam for over 400 years. The city was strategically positioned, in that during several months of the year, the flood plains around the city would be flooded by the many rivers, making enemy sieges virtually impossible, and so they were forced to withdraw. During this period, usually referred as the Ayutthaya period, Ayutthaya was ruled by 33 kings, comprising 5 separate dynasties. The Kingdom was a major trade centre of the East and a valuable meeting place for European merchants and traders of the orient. We can see that this period of stability and growth for the people of Siam would probably have coincided with the early cultivation and preservation of the early feline families associated with this society and it was during this period, between 1350 and 1767, that the original 'Tamra Maew' document was created. It would seem reasonable to assume that many of the cats we know exist today and which came out of Thailand, such as those we know now as the Siamese, the Korat, the Khao Manee, but also Burmese and Tonkinese would all have simultaneously existed at Ayutthaya in either or both the palace or temple compounds. In April 1767, the Burmese Army successfully sacked the great capital city of Ayutthaya, burning its palaces, temples and libraries and the only surviving documents were those rescued by the monks and priests who escaped with them. And of course, we can only surmise that at least some of the many cats described in the 'Tamra Maew' and the later 'Smud Khoi', would have been carried off to safety by their charges. It was at this point in time, that the capital moved south to Bangkok and the 'Chakri' dynasty began. The ruins of the old capital of Ayutthaya are now a historical park and were declared as a UNESCO World Heritage Site, in December 1991. So when we think of 'Siamese' cats in the context of those imported into France, England and later the United States, during the latter part of the 19th and early twentieth century, we need to consider that these included examples of the varieties known as 'Royals', 'Chocolates' and even 'Blues'. A peek at the Blues! Could this have been the first 'Korat' to be exhibited in England? No further information is given. We are not told whether the Blue coat was of one even shade, or whether it was darker at the points, or what the eye colour was. Could this have been the first 'Korat' to be exhibited in England? If nothing else, history teaches us that there is nothing new under the sun, and that we need to maintain an open mind in regard to all possibilities. The journey into the story behind 'Netherlands Ma' and 'Netherlands Tilu' has shown us that, under a different set of circumstances, the Siamese Cat Club may well have become the first true club for 'Thai cats' of all persuasions and varieties. Its unilateral early acceptance of the Chocolate Variety and noting that it was a "separate breed" was a firm step in this direction! Sadly, with the loss of interest in the 'Chocolate' variety, it would be another 40 to 50 years before Blue and Chocolate pointed cats became an acceptable and desirable prospect. 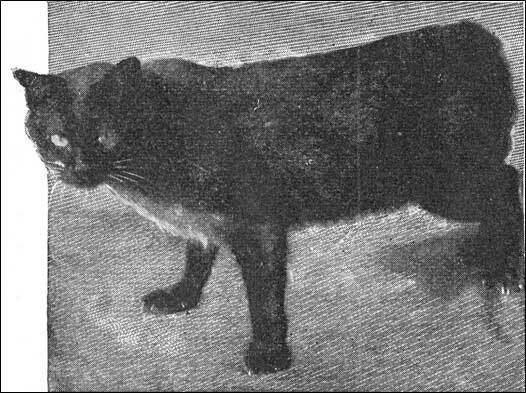 And a little "Burmese" cat called 'Wong Mau' would head to American shores, only to be proven in time, to be a hybrid, a 'Tonkinese', from which the gene for pure 'Burmese' colouration would carefully and systematically be extracted and separated, becoming the foundation for re-establishing an original breed. Perhaps she was not the first? Perhaps many such 'dark brown cats' with darker points, called 'Chocolates', were imported well ahead of her and instead of breeding for the Browns, breeders instead chose to breed for the seal-points, discarding the 'off-coloured' kittens as pets, similarly extracting the genes for the purest form of well-defined pointing, and by so doing, re-creating the original 'Wichien Maat'!